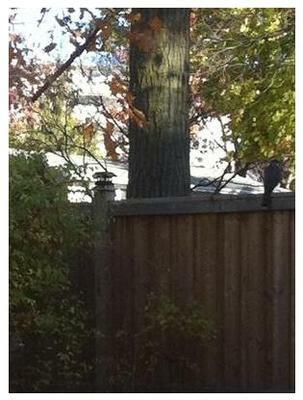 I live in Applewood in Mississauga, Ontario, surrounded by many large trees and have recently seen some large birds that I assume are birds of prey. 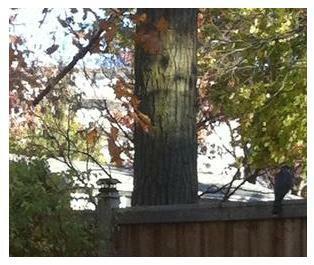 The one I saw on my gate must have been 18" tall with a rounded beak. This other one I was able to get a quick "although not good" picture of. It looked about 1 foot tall and as you can see has a black & white tail. Do you have any idea what type of bird this is? Thanks for your report and picture. I don't know what kind of bird this is, but perhaps one of our readers may know. I will come back soon for more information! I just saw the same thing in my backyard. I live near Applewood as well. I looked at this website to find out what it was. It looked like a falcon, but I did not recognize it. I do not know how to post photos to this website but I got a picture of it flying away - quite the wingspan. You can send pictures to us here Birds of Prey ..... where is says "Enter your title" just click there, add your title and the information about your sighting, and you can add up to four pictures!